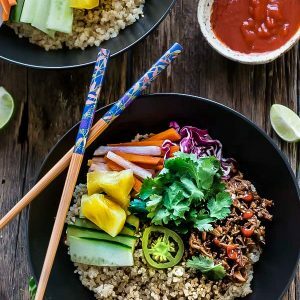 Slow Cooker Honey Sriracha Pulled Pork Quinoa Bowls - an easy and flavorful meal that's perfect for busy weeknights. Served with pickled vegetables, sweet pineapples, and cool cucumber. In the bottom of a 5-6 quart slow cooker, combine tomato sauce, Sriracha, pineapple juice, honey, hoisin sauce, fish sauce, vinegar, salt, pepper, onion, garlic, and ginger. Nestle the pork in the middle and spoon sauce over top. Cover and cook on low for 7-8 hours or high for 4-5 hours, rotating once during the cooking process, if possible. Transfer pork to a cutting board and shred using two forks. Return pork to the slow cooker and toss to coat with sauce then squeeze in lime juice. Divide quinoa into bowls and layer with pork, pickled vegetables, cucumber slices, cilantro and top with mint, sliced jalapenos and a drizzle of Sriracha, if desired. In a medium resealable bowl or a mason jar, combine 2 tbs rice vinegar, 1 tbs sugar, salt then add 1/2 cup shredded carrots and 1/2 shredded. Seal bowl or jar and store in refrigerator until ready to assemble.